Learn the differences and advantages between our two Query Building tools. UpContent uses what is known as boolean search to isolate your searches to just the content you care about. This method is more complicated than a typical search engine query, but can return better results if used correctly. We've attempted to take the complication out of this (without sacrificing the results) by creating two tools to correctly format an effective boolean search query, without you having to know all of the operators and formatting necessary. 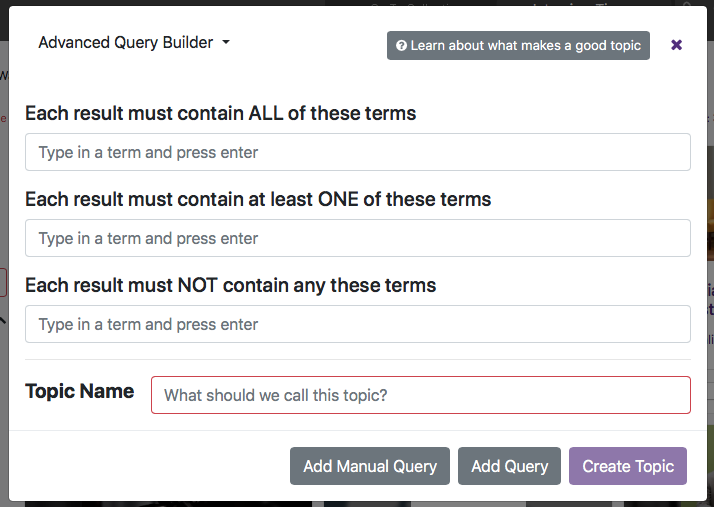 The Guided Query Builder will walk you through the steps of creating a basic boolean query. The point of this is to help familiarize you with the structure of a boolean query, and the purpose of each of the operators (AND, OR, & NOT). If this is your first time searching with us, it's probably best to use the Guided Builder for your first handful of searches. The Guided Builder has it's limitations, however, as it doesn't allow for more complex, targeted queries - which is where the real magic of boolean searching lies. The Advanced Query Builder still does all of the formatting for you, so you don't need to be a boolean wizard to get the most out of it. You can add more terms to the first clause (ANDs) to further narrow your results. You can add additional queries to the same topic, which will allow you to bring different but related results to the same topic. You can also edit your query directly to make adjustments to bring you more diverse results. Adding synonyms is often a productive use of this. If you would like a more detailed walkthrough of how to create effective topics, feel free to schedule a complimentary topic creation session with us, or read through the rest of our topic creation help articles.